Presented here is a straightforward approach to the redesign of a culture, in which the age-old inadequacies of war, poverty, hunger, debt, and unnecessary human suffering are viewed not only as avoidable, but totally unacceptable. This new social and economic design works towards eliminating the underlying causes that are responsible for many of our problems. But, as stated previously, they cannot be eliminated within the framework of the present monetary system and political establishment. Human behavior is subject to the same laws that govern all other physical phenomena. Our customs, behaviors, and values are byproducts of our culture. No one is born with greed, prejudice, bigotry and hatred – they are learned. If the environment is unaltered similar problems will reoccur. These aspirations cannot be accomplished in a monetary based society of waste and human exploitation. With its planned obsolescence, neglect of the environment, outrageous military expenditures and the outworn methods of attempting to solve problems through the enactment of laws, these methods are bound to fail. Furthermore the belief that advanced technologies would lead to an improvement in the quality of life for most people is not the case in a monetary system. More and more companies are adopting the tremendous benefits of automation, resulting in increased production with fewer employees. Corporations’ short-term concern with profit will ultimately result in the demise of the world monetary based economies. If the monetary system continues to operate, we will be faced with the condition of more technological unemployment, today referred to as downsizing. From 1990 to 1995, companies dismissed a staggering 17.1 million employees, many of these due to automation. Automation will continue to replace people well into the foreseeable future, resulting in the lack of purchasing power for these displaced workers. Despite expanding global markets, the human cost in terms of displaced workers and a disenfranchised populous, will inevitably bring about massive and unmanageable social problems. During the 1930’s, at the height of the Great Depression, the Roosevelt administration enacted new social legislation designed to minimize revolutionary tendencies and to address the problems of unemployment. Jobs were provided through the Works Progress Administration, Civilian Conservation Corps, National Recovery Act, transient camps, and Federal Arts projects. Ultimately, however, World War II pulled the U.S. out of that worldwide depression. If we permit current conditions to take their natural course, we will soon be faced with another international recession of potentially greater magnitude. At the time of this depression the US had only 600 first class fighting aircraft at the beginning of World War II, we rapidly increased production to 90,000 planes per year. Did we have enough money to pay for the required implements of war? The answer is no. Neither did we have enough gold. But, we did have more than enough resources. It was the available resources and personnel that enabled the U. S. to achieve the production and efficiency required to win the war. Unfortunately, such an all-out effort is only considered in times of war or disaster. We live in a culture that seems to work collectively only in response to a crisis. Only in times of war do we call upon and assemble interdisciplinary teams to meet a threat from human aggression. Only in times of national emergency do we do the same to resolve a natural or man-made threat. Rarely, if ever, do we employ a concerted effort to help find workable solutions to social problems. If we apply the same efforts of scientific mobilization toward social betterment as we do during a war or disaster, large-scale results could be achieved in a relatively short time. The Earth is still abundant with resources. Today our practice of rationing resources through monetary methods is irrelevant and counter-productive to the well-being of people. Today’s society has access to highly advanced technologies and can easily provide more than enough for a very high standard of living for all the earth’s people. This is possible through the implementation of a resource-based economy. Simply stated, within a resource-based Economy we will utilize existing resources rather than money, and provide an equitable method of distribution in the most humane and efficient manner for the entire population. It is a system in which all natural, man-made, machine-made, and synthetic resources would be available without the use of money, credits, barter, or any other form of symbolic exchange. A resource-based economy would utilize existing resources from the land and sea, and the means of production, such as physical equipment and industrial plants, to enhance the lives of the total population. In an economy based on resources rather than money, we could easily produce all of the necessities of life and provide a high standard of living for all. To further clarify the concept of a resource-based economy consider this example: A group of people is stranded on an island with enormous purchasing power including gold, silver and diamonds. All this wealth would be irrelevant to their survival if the island had few resources such as food, clean air, and water. Only when population exceeds the productive capacity of the land do problems such as greed, crime, and violence emerge. On the other hand, if people were stranded on an island that was abundant with natural resources producing more than the necessities for survival, then a monetary system would be irrelevant. It is only when resources are scarce that money can be used to control their distribution. One could not, for example, sell the air we breathe, the sand on the beach, or the salt water in the ocean to someone else on the island who has equal access to all these things. In a resource-based economy all of the world’s resources would be held as the common heritage of all of the earth’s people, thus eventually outgrowing the need for the artificial boundaries that separate people – this is the unifying imperative. We must emphasize here that this approach to global governance has nothing whatever in common with the present aims of a corporate elite to form a world government with themselves and large corporations in control, and the vast majority of the world’s population subservient to them. Globalization in a resource-based economy empowers each and every person on the planet to be the very best they can be, not to live in abject subjugation to a corporate governing body. All socio-economic systems, regardless of political philosophy, religious beliefs, or social customs, ultimately depend upon available natural resources, e.g. clean air and water, arable land, and the necessary technology and personnel to maintain a high standard of living. This can be accomplished through the intelligent and humane application of science and technology. The real wealth of any nation lies in its developed and potential resources and the people who are working toward the elimination of scarcity and the development of a more humane way of life. A resource-based economy would use technology to overcome scarce resources by utilizing renewable sources of energy; computerizing and automating manufacturing, inventory and distribution; designing safe, energy-efficient cities; providing universal health care and relevant education; and most of all, by generating a new incentive system based on human and environmental concern. Unfortunately, today science and technology have been diverted from these ends for reasons of self-interest and monetary gain through the conscious withdrawal of efficiency, or through planned obsolescence. For example, it is an ironic state of affairs when the U. S. Department of Agriculture, whose function is to conduct research into ways of achieving higher crop yields per acre, pays farmers not to produce at full capacity while many people go hungry. Another example is the choice of some companies to illegally dump solid waste into oceans and rivers to save money, when more ecologically sound disposal methods are available. A third example is the failure of some industries to install electrostatic precipitators in their factories’ smokestacks to prevent particulate matter from being released into the atmosphere, even though the technology has been available for over 75 years. The monetary system does not always apply known methods that would best serve people and the environment. In a resource-based economy, the human aspect would be of prime concern, and technology would be subordinate to this. This would result in a considerable increase in leisure time. 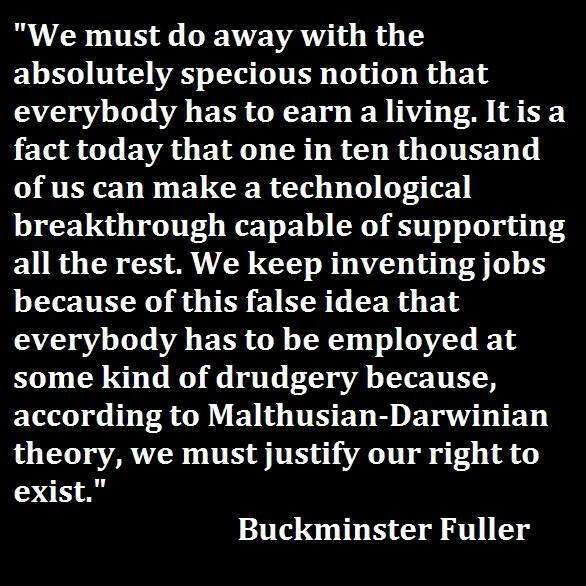 In an economy in which production is accomplished primarily by machines, and products and services are available to all, the concepts of “work” and “earning a living” would become irrelevant. But if the human consequences of automation are unresolved, as they are today, then it renders all the advances of science and technology of much less significance. The utilization of today’s high speed and large capacity computer systems, otherwise known as the “Information Superhighway” or Internet, could assist us in defining the variables and parameters required for the operation of a resource-based economy that conforms to environmental needs. Over-exploitation of resources would be unnecessary and surpassed. Many people believe that there is too much technology in the world today, and that technology is the major cause of our environmental pollution. This is not the case. Rather, it is the abuse and misuse of technology that should be our major concern. In very simple terms, a hammer can be used to construct a building, or to kill another person. It is not the hammer that is the issue, but how it is used. 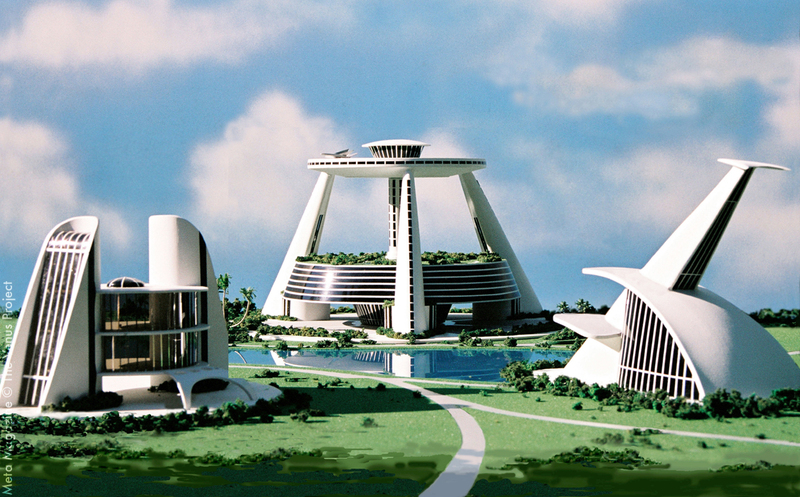 Cybernation, or the application of computers and automation to the social system, could be regarded as an emancipation proclamation for humankind if used humanely and intelligently. Its thorough application could eventually enable people to have the highest conceivable standard of living with practically no labor. It could free people for the first time in human history from a highly structured and outwardly imposed routine of repetitive and mundane activity. It could enable one to return to the Greek concept of leisure, where slaves did most of the work and men had time to cultivate their minds. The essential difference is that in the future, each of us will command more than a million slaves – but they will be mechanical and electrical slaves, not fellow human beings. This will end forever the degrading exploitation of any human being by another so that he or she lives an abundant, productive, and less stressful life. Perhaps the greatest aid in enhancing the survival of the human race is the introduction of cybernation, the electronic computer, and artificial intelligence, which may very well save the human race from its own inadequacies. A resource-based economy includes the redesign of our cities, transportation systems, and industrial plants so that they are energy efficient, clean, and conveniently provide the needs of all people both materially and spiritually. These new cybernated cities would have their electrical sensors’ autonomic nervous system extended into all areas of the social complex. Their function would be to coordinate a balance between production and distribution and to operate a balance-load economy. Decisions would be arrived at on the basis of feedback from the environment. Despite today’s mania for national security, and subsequent intrusions into everyone’s personal affairs, in a world-wide resource-based economy where no one need take from another, it will be considered socially offensive and counterproductive for machines to monitor the activities of individuals. In fact, such intrusion would serve no useful purpose. To further understand the operation of cybernation in the city system, for example, in the agricultural belt the electronic probes imbedded in the soil would automatically keep a constant inventory of the water table, soil conditions, nutrients, etc. and act appropriately without the need for human intervention. This method of industrial electronic feedback could be applied to the entire management of a global economy. All raw materials used to manufacture products can be transported directly to the manufacturing facilities by automated transportation “sequences” such as ships, monorails, trains, pipelines, and pneumatic tubes, and the like. All transportation systems are fully utilized in both directions. There would be no empty trucks, trains, or transport units on return trips. There would be no freight trains stored in yards, awaiting a business cycle for their use. An automated inventory system would be connected to both the distribution centers and the manufacturing facilities, thus coordinating production to meet demand and providing a constant evaluation of preferences and consumption statistics. In this way a balanced-load economy can be assured and shortages, over-runs, and waste could be eliminated. The method for the distribution of goods and services in a resource-based economy without the use of money or tokens could be accomplished through the establishment of distribution centers. These distribution centers would be similar to a public library or an exposition, where the advantages of new products can be explained and demonstrated. For example, if one were to visit Yellowstone National Park, one could check out a still or video camera on-site, use the camera, and if they do not want to keep it, return it to another readily accessible distribution center or drop-off point, thus eliminating the individual’s need to store and maintain the equipment. In addition to computerized centers, which would be located throughout the various communities, there would be 3-D, flat-screen televised imaging capabilities right in the convenience of one’s own home. If an item is desired, an order would be placed, and the item could be automatically delivered directly to a person’s place of residence. To better understand the meaning of a resource-based economy consider this: If all the money in the world were to suddenly disappear, as long as topsoil, factories, and other resources were left intact, we could build anything we chose to build and fulfill any human need. It is not money that people need, but rather it is freedom of access to most of their necessities without ever having to appeal to a government bureaucracy or any other agency. In a resource-based economy money would become irrelevant. All that would be required are the resources, manufacturing, and distribution of the products. Take the automobile. In order to service conventional automobiles today we have to remove a great deal of hardware before we can get to the engine. Why are they made so complicated? This reason is simply because ease of repair is not the concern of the manufacturers. They do not have to pay to service the car. If they did, I can assure you, they would design automobiles that consist of modular components that could be easily disengaged, thus facilitating easier access to the engine. Such construction would be typical in a resource-based economy. Many of the components in the automobile would be easily detachable to save time and energy in the rare case of repair, because no one would profit by servicing automobiles or any other products. Consequentially all products would be of the highest quality, and they would be simplified for convenience of service. Automotive transport units engineered in this way can easily be designed to be service-free for many years. All the components within the car could be easily replaced when needed with improved technologies. Eventually, with the development of magnetically suspended bearings, lubrication and wear would be relegated to the past. Proximity sensors in the vehicles would prevent collisions, further reducing servicing and repair requirements. This same process would be carried out for all other products. All industrial devices would be designed for recycling. However, the life span of products would be significantly increased through intelligent and efficient design, thereby reducing waste. There would be no “planned obsolescence,” where products are deliberately designed to wear out or break down. In a resource-based economy technology intelligently and efficiently applied will conserve energy, reduce waste, and provide more leisure time. During the transition, the workweek could be staggered thus eliminating traffic jams or crowding in all areas of human activity, including beaches and recreation areas. Most packaging systems would be standardized, requiring less storage space and facilitating easy handling. To eliminate waste such as newsprint, books, and other publications, these could be replaced, for example, by an electronic process in which a light-sensitive film is placed over a monitor or TV, producing a temporary printout. This material would be capable of storing the information until it is deleted. This would conserve our forests and millions of pounds of paper, which is a major part of the recycling process. Eventually, most paperwork would no longer be required, i.e. advertising, money, mail, newspaper, phonebook. As we outgrow the need for professions that are based on the monetary system, such as lawyers, accountants, bankers, insurance companies, advertising, sales personnel, and stockbrokers, a considerable amount of waste and non productive personnel could be eliminated. Enormous amounts of time and energy would also be saved by eliminating the duplication of competing products. Instead of having hundreds of different manufacturing plants and all the paperwork and personnel that are required to turn out similar products, only very few of the highest quality would be needed to serve the entire population. In a resource-base economy planned obsolescence would not exist.